This year the Constructed Wetland Association’s annual conference will run alongside the European Waste Water Management Conference (EWWMC) presenting the opportunity to explore overlapping fields and new areas for collaboration. Natural and constructed wetlands play an important role in the treatment, management and control of water pollution, in the mitigation and treatment of run-off and in the retention of floodwaters. By integrating these different fields, solutions can frequently deliver additional ecosystem service benefits such as carbon storage, urban cooling, nutrient cycling and recreation amongst others. Innovative design can ensure these systems maximise biodiversity whilst providing blue and green spaces that contribute to human well-being. 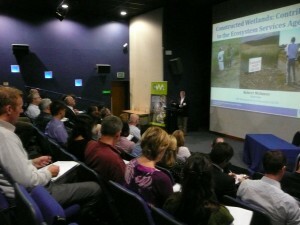 As in previous years, the conference will continue to share and promote best practice in the design, implementation and management of constructed wetlands in the wider water environment, but this year with an emphasis on direct practical experience, new initiatives, case studies and research. The Conference programme has now been released and registration is open! Book now for Early Bird rates.